Alchemy in the Kitchen: Cointreau Cumberland – a saucy little number ! It’s funny how Cumberland Sauce has ended up being a quintessentially English sauce when it has its roots in Germany – a bit like the royal family, you might say. Traditionally, it comprises port and redcurrant jelly with a few other bits and pieces - ground ginger, powdered mustard etc. It should be thin, and sweet-ish, a pretty ruby colour with the gentle kick of a retired can-can dancer. 1. First, using a vegetable peeler, thinly peel the zest from the lemon and the orange, leaving as much of the white pith behind. Trim the peelings with a sharp knife to remove any of this bitter pith that still clings to the zest. Cut the peel into 4cm lengths trimming the edges so they are straight (this looks nicer in the finished sauce). You can discard the uneven trimmings. 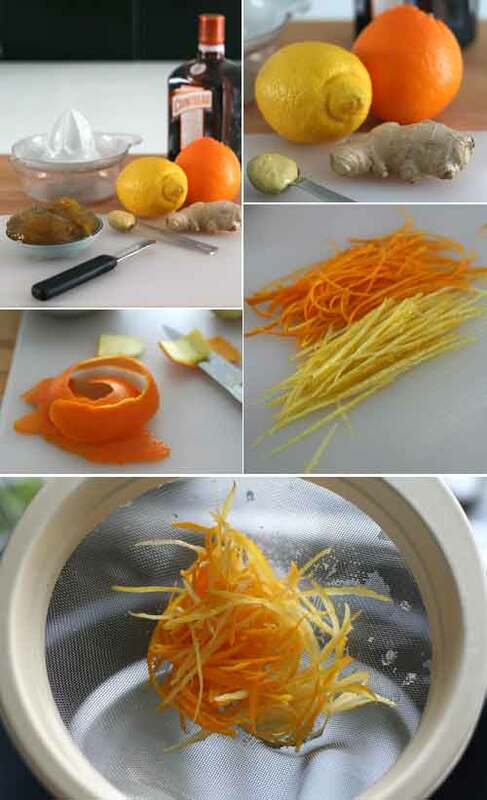 Cut the strips of zest into the thinnest shreds you can manage. Put them in a small bowl and cover with boiling water to soften the flavour. 2. While the zest is soaking, place the plum jam in a small saucepan, with the Cointreau, ginger, lemon juice and orange juice. Heat gently until simmering and allow to bubble gently for about 8 minutes, stirring occasionally. This will help evaporate some of the alcohol. 3. Pass the sauce through a strainer to remove the ginger and any fruity pulp from the jam and fruit juices. Taking a little of the strained sauce, added it to the mustard, mixing until smooth. Return this mixture to the sauce. Drain the shredded zest and pat with kitchen paper to remove any excess water before adding to the sauce. Leave to cool. I particulary love this sauce with this ridiculously easy chicken liver pâté. Love Oranges, wish I had time to do things like that with them! Oranges always remind me of Christmas no matter what seson! i love all the citrus flavors in this! I've never heard of Cumberland sauce, but it's beautiful...and the combination of ingredients sounds fantastic! Merry Christmas, my friend!!! Hester, love all the wonderful pictures, the colors are really bright and fresh - which is very nice right now, somehow we are surrounded by soo much greens and reds, so your post stands really out! 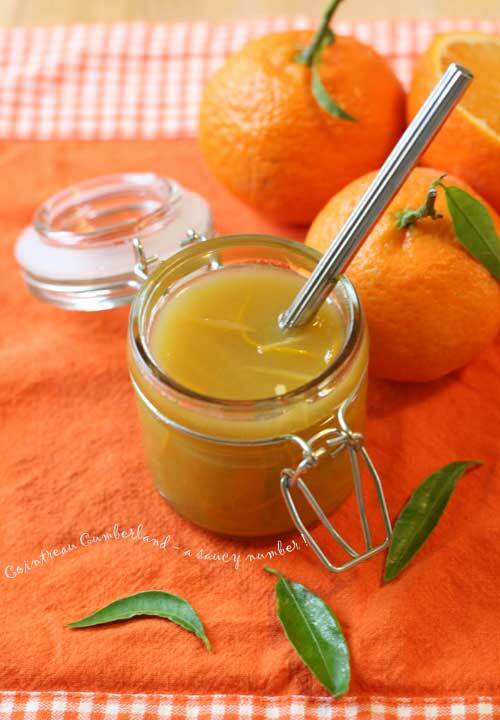 The recipe for the Cointreau Cumberland Sauce sounds fabulous! I would also like to take the opportunity to whish you a very Merry Christmas and all the best for the upcoming year! It has been a real pleasure connecting with you and your wonderful blog! Looking forward to many more great posts! Your cumberland sauce looks refreshing surrounded by this wonderful bright orange. I feel I can taste the tang through this great picture! I haven't had cumberland sauce in a long time...I used to have it with duck. Thank you for your post. Have a wonderful Christmas. I bought Cointreau to make ice cream this year but after that the same bottle still stays in the cabinet. I am not creative enough to come up with a recipe using it, and now this sauce looks and sounds wonderful! I love the citrus flavor and what a great match with cointreau! I love the spicy ginger and Dijon combination with the citrus. It sounds completely delicious! Oh my gosh, your pictures make my mouth water ;) so happy to be here! Waving hello from a new follower, Hazel. What a refreshing a lovely sauce! I've never heard of Cumberland Sauce--it sounds really cool! I like how you gave the recipe a twist and kicked things up for the holidays. Hester, you make me wish I'd had Christmas all over again to just taste this sauce-with-a-kick! Beautiful. Wishing you a delicious New Year. Cheers! I loved this recipe. I particularly love the flavour of cointreau and I think this sauce is just delicious! Let me go and check your chicken liver pate recipe now.